Shrinkage is just one of the possible headlines for this post. Other candidates?? I could go on. The Seinfeld theme refers to my second headline choice. How plans and the event shrunk. It has nothing to do with...ahhh...well...you know. I was originally doing the Half Iron. But as my previous post pointed out, my hamstring muscles held a heated meeting and caused me to tweak the hammy again Friday morning. I took their hint and decided just to do the Aquabike. 1.2 mile swim, followed by the 56 mile bike. 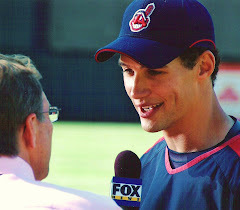 That way, I would not run and aggravate the hamstring. Great plan. But we did not consult the Lake. I should have known. Angry lake. Strong winds and strong current and Mickey and the Greater Cleveland staff made the right choice. They cancelled the swim. I understood completely. I took my wrath out on the shallowest of the Great Lakes. I didn't flip it off, I just shouted...."I'm upset with you right now but I'll get over it."? 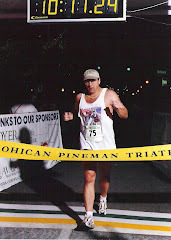 Hey, I survived the infamous Fogman-Pineman-Ironman in 99'. Hey, it was a beautiful morning. Love the sunrise.!!!! The wind was very strong. The guys putting up the start arch thingy had a tough time stabillizing it. Transition was filling up fast. Racers knew immediately that the swim was not happening. I hooked up with dozens of my triathlon buddies. Matt, Jen, Eric, Aimee, Tracie, doing her second triathlon. Joe R. Jeff, Bill M. Karen, Juan, Bill, Eddie. Tanya, mother of a little girl with cerebral palsy, who had raced her first tri last week. Tanya was doing the Aquabike also. Saw Janet and Jodi but didn't get a chance to say hi. I think everyone was just resigned to the notion that we would all have to make lemonade out of lemons. They sent off the Half Iron racers at 7:15. They would have to run about 1.2 miles and then head to thier bikes. Us Aquabikers were going off at 7:45. The wind played a factor in several areas of the course and because it was going off the Lake. It was strong. I was loaded up with a few gels, one bottle of replacement fluid and one of water. We did 2 big loops up into Concord, and toward Little Mountain. Theres a very steep but not terribly long hill you have to stand on the pedals to get up..then a gradual climb after that...but the course is fun to ride because you can get some speed going on the way back. On the second loop you get to the entrance of the park and you then have to go back and do 2 fairly short loops, but the wind really seemed to be strong as I did my final two loops. All in all, I had a solid effort. I was after a 3 hour or under time, but settled for an unofficial 3:13 but I have to check the final results. For show purposes only,we had to leave transition and go out and over to the overall finish area. That did not affect our time, it was just so they could give us our medals and get our timing chip. I just put on a cap and walked over and through the finish in my bare feet.. Some riders were stopped by trains. Volunteers took their numbers and then officials adjusted their times. I nearly was stopped . I even heard the train sound, but I came through the second crossing and the gates were up. Other riders complained there were several little trains..meaning a string of riders, obviously drafting which was illegal. I did see some numbers on the results with some kind of violations listed so I know they were docking people for these, but maybe not as much as was going on. However...it was a perfect day to ride despite the wind. Cool. Just perfect. Afterwards I hung out. Listened to Charlie entertain and compared racing tales. Later , at home, all the swim caps from my 08 races had a little get together.. They even welcomed in the bright Yellow cap I was to use today... Treated the little guy like one of the family. It was touching. But the wetsuit..!!!?? He was obviously put off that there was no swim. He just hung out in on the patio , getting some sun, and not socializing with the caps. What an attitude.!! Later, I fired up the grill and cooked up hamburgers, chorizo hamburgers and get this.....BISON. No pics, but it was tremendous. They say bison is a great source of protein. All I could think of was Kevin Costner and "Dances with Wolves" That got me thinking of some of the triathletes who still wanted to race in the very strong Lake Erie current. How about "Dunces with Waves"
Bison is yummy! Love me some bison burgers! .. and lol at your swim cap get together! Very wise not to anger the "great lake". Yes, blogger Vickie had her dreams dashed by similar waves for steelhead....all that training, sigh. Excellent post John and nice job on the bike yesterday too! Nice talking to ya Satuday! 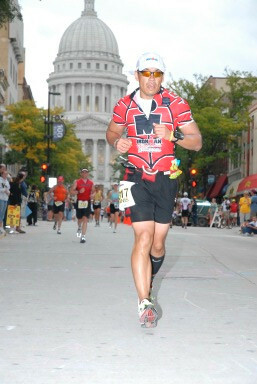 Great effort and love the lake pics!!! Glad you made lemonade yesterday! The great thing about GCT is that it is the best tri party in town. Swim or no swim it is a great day. Saw you finish. I wondered what change you made in race choice as you looked to be well under WR time. Smart decision. i of course felt the same but was prepared by the news the night before and was HOPING the lake would not act as predicted. I was originally in shock when I heard about the swim being cancelled. I guess the lake wasn't feeling like entertaining visitors that day. Bison sounds good. Good job on your bike split. Dunces with Waves....probably a movie that I'd star in. That poor poor wetsuit. He deserves to have an attitude after putting in all that training! Seems like everyone is having Bison this week. Attack of the Bison burgers apparently. Sorry to hear about the swim being cancelled. espcially sucky, if you are doing the aquabike.. But great job on the bike ride..
That would be frustrating to have the swim cancelled, but it was probably wise. Better safe!! Seinfeld (or I guess George in this case) definitely has a way with words! Too bad that the yellow swim cap got a pass for this race but at least the other caps showed some sportsman like behavior toward him! Has the wetsuit recovered yet? Congrats on the bike time, almost at your goal! too bad about the lack of swim on sunday. i'm not a big fan of lake erie.